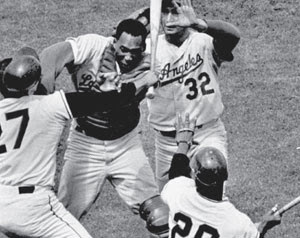 Most people think of the Roseboro-Marichal brawl as a baseball thing—the Dodgers-Giants rivalry writ large. 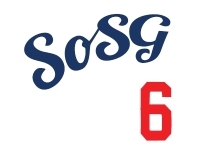 You make clear that Marichal was worried about the civil war happening in his homeland of the Dominican Republic while Roseboro was witness to the Watts Riots in L.A. that very summer. How did those events affect what happened at Candlestick Park? During that "summer of fury," social tensions impacted both men personally. Marichal was literally worried sick over his family's safety back home while he watched on television the bloody war being fought in the streets of Santo Domingo. He also had a terrible sinus infection, and his teammate Willie Mays said Marichal was so distraught he shouldn't be pitching. Roseboro, a black man living in South Central LA, had just experienced the Watts Riots the week before. He and his teammates watched the buildings burn from Dodgers Stadium—they could see the smoke—and Roseboro wondered how they could still be playing baseball when this was happening. One night, the demonstrators planned to march down the street that ran in front of his house so Roseboro stayed up on the stoop with a loaded gun to protect his home and family. Both men were on edge and, as often happens, those social tensions spilled out onto the field. UPDATE from P. Diddy: NPR audio here.